Can ragi be given to babies? Looking for an easy to make ragi recipe for your little munchkin? 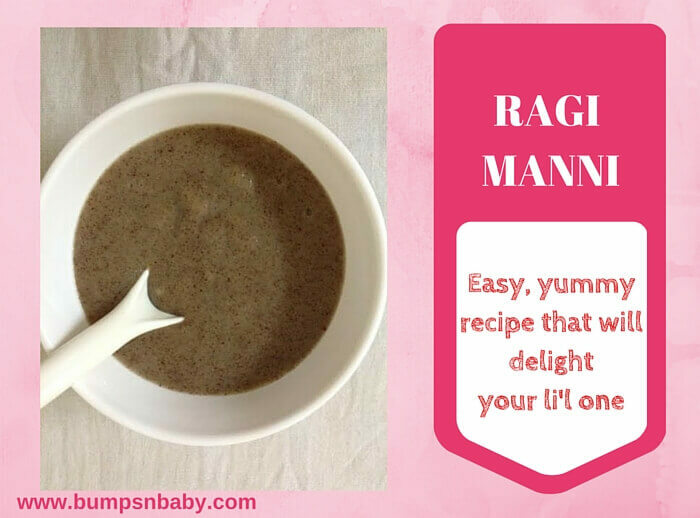 Is there a recipe known as ragi manni for babies? Then look no further, today’s post is about a yummy recipe, ragi manni for babies. Ragi or finger millet is called a poor man’s food, because it is not expensive, but it has a lot of goodness. I have already mentioned its benefits and how to prepare sprouted ragi flour in my previous post. Ragi is nutritious and yet very versatile. Did you know you can also make homemade cerelac, soup, dumplings (kozhukkattai), dumplings in milk (paal kozhukattai), idli, dosa etc all using ragi? Ragi manni also known as finger millet pudding is one of the most commonly prepared first baby food in almost every Indian household. There are two versions of ragi manni or ragi halwa: sweet and salt version. I normally prepare sweet ragi manni, which is also called nachane duddalli, for my little one as he likes that better. Today I will tell you how to make ragi manni at home. I will explain you how to prepare both sweet and salty one so that you can make what your little munchkin desires. I have modified the recipe a bit to suit the palette and tummies of babies. Add 1.5 tablespoon of ragi powder in water and mix well ensuring there are no lumps. Heat this on a low flame by stirring it continuously till ragi is cooked and it starts to thicken. At this stage add in milk by stirring constantly. Once it is completely cooked, add jaggery or palm sugar or regular sugar to taste. You can add ghee at this stage if you want to make it richer. Heat this on a low flame stirring it continuously till the ragi is cooked and it starts to thicken. Once it has thickened and cooked completely, add salt to taste. Allow it to cool a little bit and add yogurt to this. If your child is less than one year do not use cow’s milk. If your baby is on formula, add a little prepared formula milk at the end after switching off the stove. If the child is one year old and above, you can even use almond powder, cashew nut powder or dry fruit powder to the porridge to make it more nutritious. Hope you liked this ragi halwa recipe, your kiddo is sure to love this too. Do you make ragi manni at home? Is there any variations you make in the traditional ragi manni recipe? Do let me know as comments. Previous ArticleWhy Every House Needs an Air Purifier? Can please reply to below? •Apart from Apple which other fruit I can add to Porridge. Further request please explain me which fruit require to cook and which I can add as raw. Jaggery can be added upon your kids taste .not sure of the quantity but dont add too much of sugar or salt in your kid’s food . Hey, I tried this recipe as my kiddo don’t like any liquid so instead of ragi porridge i used to give him ragi halwa. Even instead of plain water I have tried Carrot and beetroot pulp and make nutritious sprouted ragi carrot beetroot halwa and he simply love it. Carrot and beetroot firstly I cooked in pressure cooker with little water and then crush it hence pulp is ready for use. This is the way we can add carrot and beetroot in his meal. So nutritiously is it right na?? ?